Did you consider majoring in dance in college? CAS does not have a dance major, and when I started college, I did not think I would be pursuing a career in dance. (Nevertheless, pretty much every decision I made in college was driven by dance. I wanted to dance as much as possible outside of school) Majoring in comparative literature gave me a unique perspective on flamenco that inspires my dancing. You began your dance training in ballet at the age of three. When did you discover flamenco dancing and what attracted you to this form of dance? Around the time I was in middle school, I was getting a bit bored of ballet. One of my dance teachers introduced me to flamenco, and I took to it immediately. I think I loved the music, the rhythms, and the variety of expression that the dancer can emote. You have received numerous prestigious awards for your dancing, but also for your studies and research. Can you talk about some of the most rewarding and memorable experiences you have had? I've traveled to Spain a few times with different grants. All of those trips have been incredibly rewarding. For my thesis, I used the DURF grant to travel to Sevilla to interview the choreographer and dancer I was focusing my thesis on. Without that interview I would not have been able to understand his work as completely for my thesis research. I also spent the year after I graduated in Sevilla with the funding of a Fulbright Research Grant. I honed my dance skills and especially deepened my knowledge of the culture around flamenco, which is essential to really understanding the music and dance. From the research you have done, is there something you learned about flamenco that others might not know or that you found to be most fascinating? My Fulbright research really focused on understanding how the dance fits with the singing. I wanted to really understand all the different styles of singing and how the characteristics of the dance changes depending on the rhythm or style being sung. Many of the towns in southern Spain have unique rhythms or styles specific to them, and understanding those differences and the unique towns that created them was eye-opening. There was even more detail than I expected to find. I spent a lot of time studying the singing and learning the songs, which is something that is essential to understanding the dancing and should not be overlooked, even as a dancer. The singing and the lyrics is also what inspires me as a dancer. Do you have a favorite song or artist to dance to? Flamenco is almost always danced to live music, and the interactions between the dancer and musicians are an essential part of flamenco. There is a language of communication and structures that both the dancer and musicians must understand. When I listen to flamenco music, Carmen Linares, Camarón de la Isla, El Chocolate, and Antonio Mairena are a few of my favorites. We really enjoyed watching the live-stream of your recent performance at the Kennedy Center for Performing Arts' Millennium Stage. Are you currently working on any upcoming projects? I am currently dancing with a company based in Santa Fe, NM called EntreFlamenco. Their summer season ends August 31. 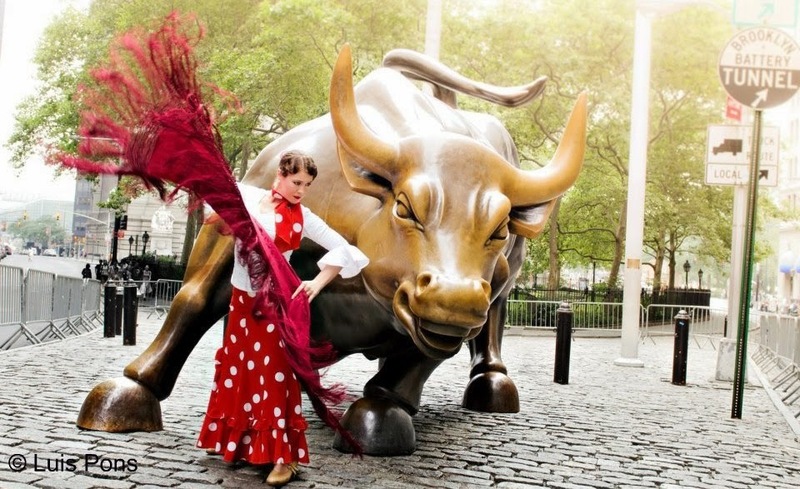 Then I will be heading back to NYC where I dance with a company called Flamenco Vivo Carlota Santana. The challenge for me back in New York will be finding the time and funding to produce my show at a theater in NYC, so I will be focusing a lot of energy on that once I am back in the city.